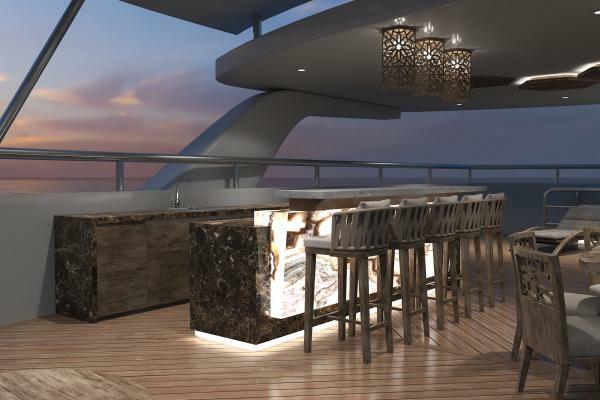 The Galapagos Elite was specifically designed for sailing the sapphire waters of the Enchanted Islands. 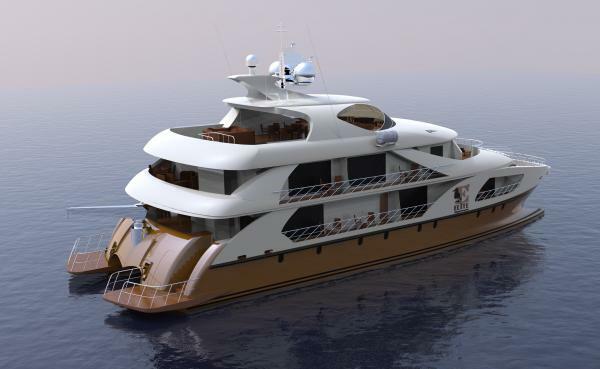 A sleek, twin-hulled catamaran, it will provide its guests with a steady, safe cruise without the rocking and swaying common to the older, single-hulled yachts. 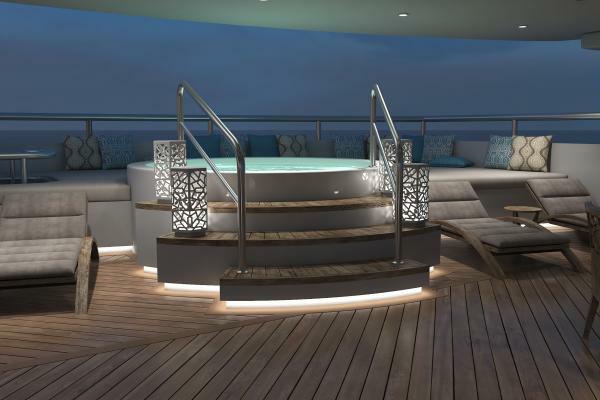 In addition to better stability, the design of the Elite allows for more space for everything on board, including social areas, suites, and premium suites. 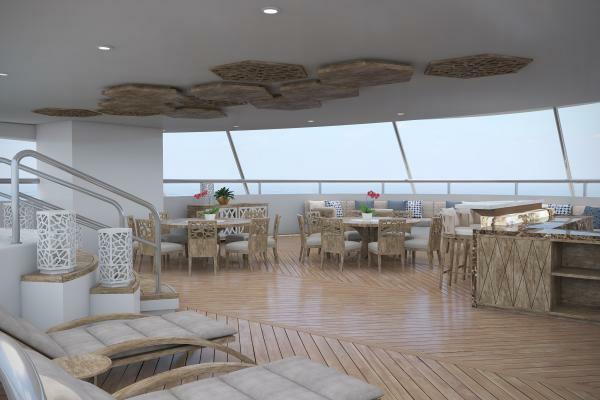 Guests of all ages, from children to seniors, will enjoy the ample, semi-covered sky deck, the al fresco dining area, and the cozy bar-salon. 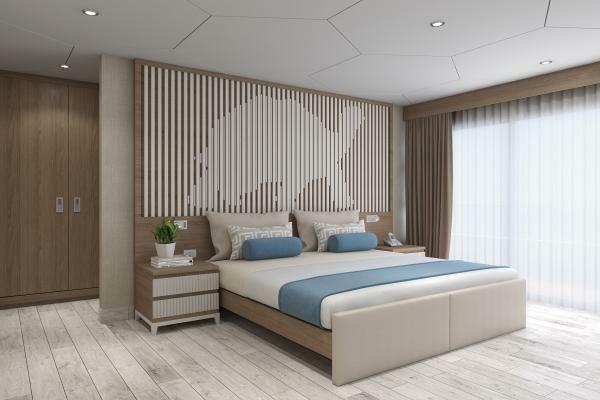 All Suites on board the Galapagos Elite will be spacious, comfortable and well-appointed: the perfect place to relax and recharge after a day spent exploring the islands. 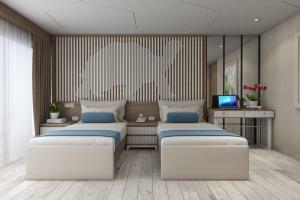 Each suite will have an ocean view and outdoor balcony, as well as rainforest-style showers in a private bathroom. The cabins have one queen-sized or two single beds. 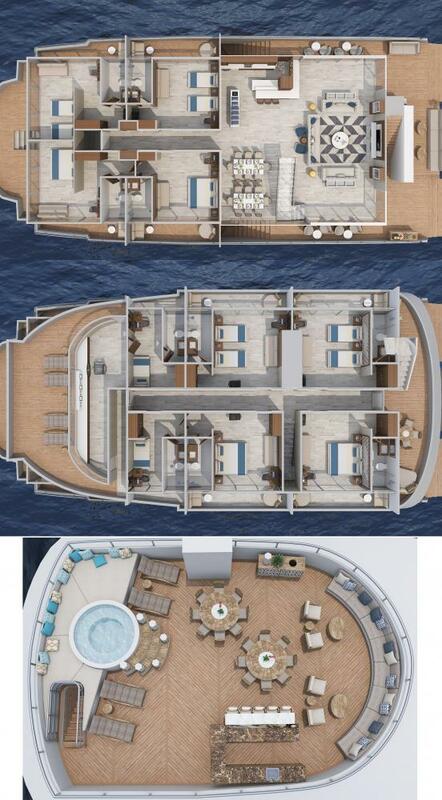 Particularly proud of the panoramic windows featured in each suite: unlike the heavy, round porthole windows of the older yachts, each suite on the Elite will have grand windows offering panoramic views. 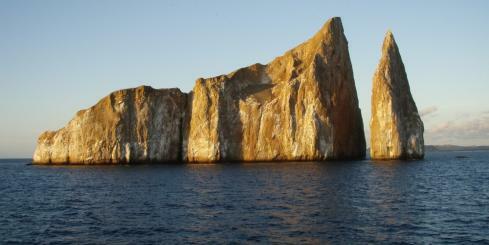 Each morning and afternoon will bring a different stunning Galapagos seascape! 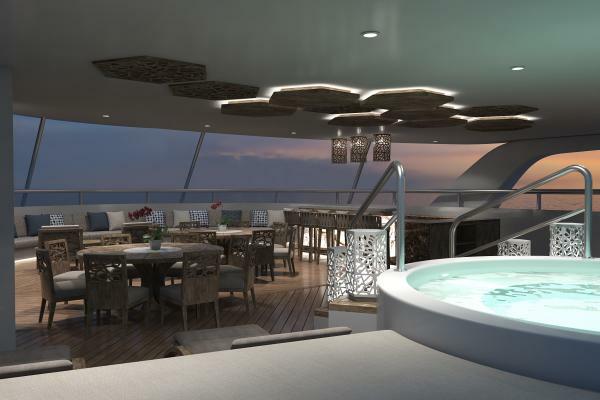 Guests will greatly enjoy meals served on board the Elite. The professional chefs prepare three delicious, nutritious meals per day: breakfast and mainly lunch will be served buffet-style, with a more elegant sit-down dinner served in the al fresco dining area on the sky deck, weather permitting. 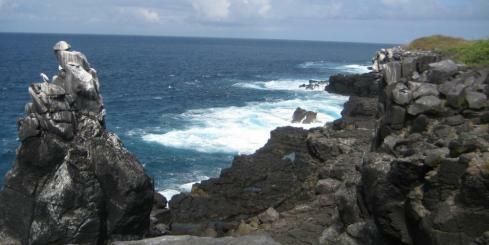 Meals are always made from fresh ingredients, locally provided from farms on the islands whenever possible. Special dietary needs are never a problem for the chefs, and kids' meals are available. 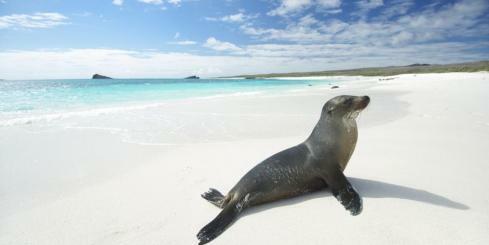 Everyone knows that the main attractions of the Galapagos Islands are the animals and the islands themselves, not the ship and the crew. 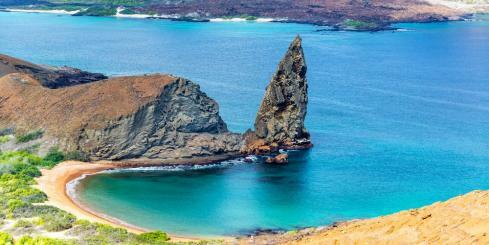 The Elite is scheduled for an enviable itinerary with visits to the best visitor sites the Galapagos islands and seas have to offer. Approximately 35 m2 the Golden Suites are spacious and comfortable. 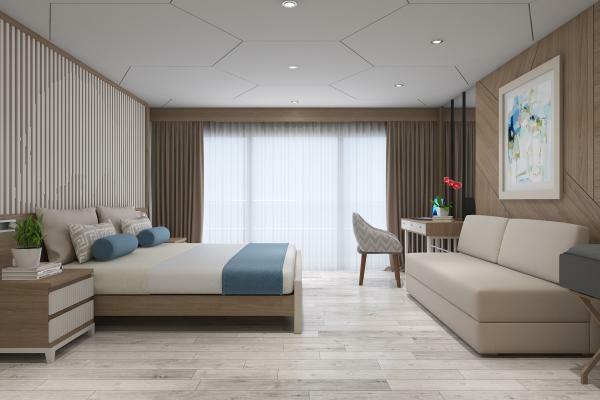 Each suite features an ocean view, sliding glass doors to an outdoor balcony, and rainforest-style showers in a private bathroom.